In April 2016, the Hermosa Beach City Council voted 5-0 to endorse Measure S, a facilities bond for the local school district. But for a unanimous decision, there was an unusual amount of talk about division. Councilmember Justin Massey acknowledged “frayed relationships.” Carolyn Petty, who was mayor at the time, described Hermosa as being at a “fork in the road.” And Councilmember Jeff Duclos alluded to a rift that had divided the community for more than a decade. “We have excellent schools because we have excellent teachers, and we have excellent students. But we don’t honor them with the facilities they need. It’s long overdue that we heal this divide that’s existed over the years, in terms of a split on how we view this. We all believe our kids deserve the best and our community deserves the best,” Duclos said. The election was hard-fought, but in June of that year, S prevailed with 60 percent of the vote. Measure S provided funds to renovate the School District’s existing campuses, Hermosa View and Hermosa Valley. But its centerpiece was the North School project. In an effort to relieve overcrowding at Hermosa View and Hermosa Valley, the district will tear down the old, subleased North School west of Valley Park and build a new, state-of-the-art campus to house students in the third and fourth grades. Earlier this month, in a unanimous vote, the district’s Board of Education approved the North School project. 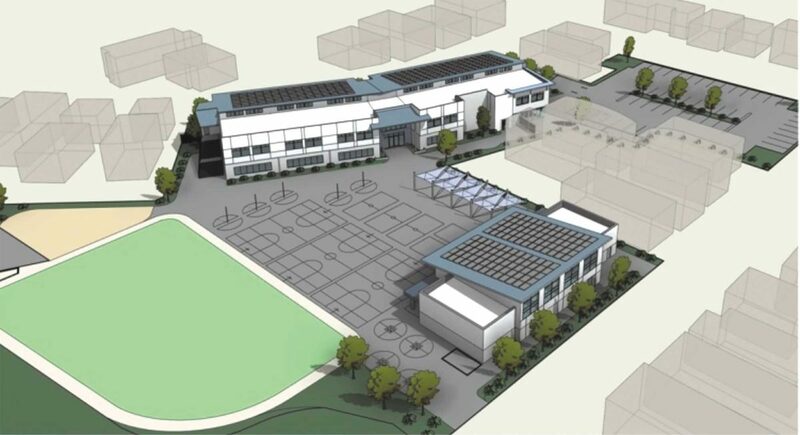 During the 31 months following the Measure S approval, the board established a vision for a model, 21st-century school. In selecting architects and builders, they prioritized environmentally friendly design, and when completed, North will be a zero-net energy campus. 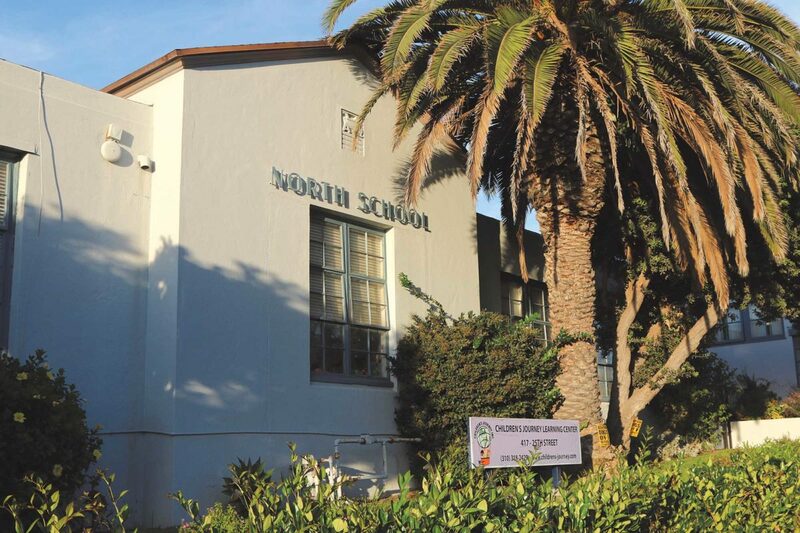 The board also sought to build a space that could take advantage of emerging educational trends: North will have no carpeting, to allow for “blended learning” and the easy movement of equipment from classroom to classroom; “outdoor learning pods” will let students take advantage of balmy Southern California weather. Others, though, have come in the form of increasingly strident criticism from some of those who backed Measure S, including the City of Hermosa Beach. Last week, a letter from City Manager Suja Lowenthal to Superintendent Pat Escalante asked the district to delay for six months the deadlines to challenge the district’s approval of planning documents associated with North’s approval, including the Final Environmental Impact Report for the project. It hinted, for the first time, at possible litigation if North were to move forward. In response, Escalante said that the school board was unable to assemble a quorum by the city’s Jan. 30 deadline, and that the issue would be discussed in closed session at the school board’s Feb. 13 meeting. “It could be inferred from the FEIR that the proposed ‘partnership’ with the City of Hermosa Beach is in question,” resident Marie Rice wrote to the board in advance of its decision about North. How did North go from an opportunity to “honor” education in Hermosa, to one in which the word “partnership” could appear in derisive scare quotes? For many in the city, little has changed. Courtney Shott is a Hermosa resident with two children in city schools. She has followed the district’s battle against overcrowding for years, and regularly speaks with other parents and bond watchers. Shott is convinced that the criticism that has emerged following the approval of the project represents a distraction from the strong support the project received at the polls, and continues to enjoy in the community. “They need to look at the will of the people as a whole, not listen to just a few voices. Absolutely, I think just about everybody who supported the bond continues to support it. Maybe even more so, given what’s happened along the way,” she said. Recent elections may support this interpretation. All seven candidates in the November 2017 election said they supported Measure S. One of the winners, current Councilmember Mary Campbell, was a school board member who helped put it on the ballot. And in the November 2018 school board elections, three candidates, all vocal Measure S supporters, ran unopposed. It’s also possible, though, that a small but significant share of voters could be turned off by the way the district has gone about preparing to open North. Rice, for example, supported Measure S, but less than two years earlier helped sink a previous school facilities bond. Asked if she would vote for it today, Rice declined to speak on the record, and pointed to her letter. The relationship between town and gown in Hermosa is burdened by history. Even after passage of Measure S, property taxes for improvements to Hermosa schools are lower than in neighboring Manhattan Beach and Redondo Beach. The explanations favored at the town’s poles — that its voters are parochial and selfish, that the district is incompetent and corrupt — fail to cover the nuanced peaks and valleys of 1.4 square miles, but get the loudest airing. Those with constructive concerns about how to address school-related issues feel sidelined, while those who care most about students worry that quality of life issues inevitably intrude into issues of educational quality. Things fall apart; the center cannot hold. Mike Flaherty spent decades working in Hermosa’s Public Works Department, eventually rising to the rank of superintendent. As one of few city employees who was also a resident, he was inevitably sought out for fix-it calls at hours when other staff had departed for the day. And occasionally he would be asked to do something requiring a rather generous reading of his job description: direct traffic along Valley Drive, near the entrance to Hermosa Valley School. Hermosa once had five elementary schools, but in the 1980s it sold of some of the properties amid declining enrollment, and used the money to turn one of the schools, Valley Vista, into Hermosa Valley, which served all K-8 students in Hermosa. The new, centralized campus brought what Flaherty recalled as “horrendous” traffic and parking challenges. He fielded complaints from residents along Valley, everything from people parking in front of driveways to making three-point turns over lawns and front yards. “I’m telling you, something happens to a mom or dad in their 30s at 8:15 in the morning that is entirely different from the rest of the mode of their day. I know it’s an anxious issue, but they turn into angry people,” Flaherty said with a laugh. But, just as people see things differently at North today, the past remains unsettled too. Resident Cathy McCurdy served on the HBCSD board from 1991 to 2009, the longest tenure in the district’s history. McCurdy said that, like today, she had to fight an onslaught of what she half-jokingly described as “fake news.” And while she was frustrated at the struggle to get factual information to the community, she disagreed with Flaherty’s characterization of the district suffering from an embattled mentality. “I don’t think it was a ‘We know best’ situation. From my perspective, I always tried to take the input of the community,” McCurdy said. What McCurdy saw instead was a “frustrating lack of trust that the board would do the right thing — a general distrust of government” that created a kind of vicious cycle: as the burden on the district mounted, its inability to meet what it saw as unreasonable expectations became reason for challengers to set the bar ever higher. McCurdy was on the board in November 2002, when Hermosa voters approved Measure J, a school facilities bond. The bond passed by an even larger margin than Measure S, with 65 percent of voters. And in March 2005, the district certified an EIR for upgrades at Valley that included a gym, a multi-purpose room, and classrooms. Within a month, a group of residents under the name Committee for Responsible School Expansion filed a lawsuit, claiming that the gym had not been mentioned in the 75-word summary of the bond measure that appeared on the ballot, and that therefore spending bond proceeds on it violated state law. The suit was dismissed the next year in a unanimous decision from the California Court of Appeal. But the district had to dip into bond proceeds to defend itself, which had the ironic effect of limiting the district’s flexibility on the Valley project, and creating greater disappointment with what resulted. Leading up to Measure J construction, Flaherty said at one point he suggested relocating the driveway entrance to fit more people on campus and have fewer queuing on the street. “They said, ‘Mike, we spent so much money in defense of the bond, we can no longer spend that money on the driveway,’” he recalled. McCurdy said that the lawsuit caused a delay of between six months and a year in starting construction, which raised the minimum bid the district received by half a million dollars. “Everybody was so freaked out that the gym was going to create a big nightmare of noise and use at odd hours. Well, that didn’t come to fruition. What did come to fruition was, we didn’t build those two extra classrooms because of increases in cost,” McCurdy said. While the district may have won the battle in court — in another irony, the opinion arguably expanded the flexibility California school districts have in spending bond proceeds, and remains good law — Measure J poisoned the district brand for some residents, and set off a bitter dispute that shadowed the district’s future fundraising efforts. In June 2008, the school board put Measure E, a parcel tax, to voters. Opponents derided the district as profligate and not worthy of residents’ trust. “Voting ‘No’ on Measure E will send the school board the right message: ‘You need to operate on a prudent budget.’ Feeding the school district more monies will not solve the problem,” wrote resident Lawrence O. Fordiani in a letter to the editor. Measure E failed, with 47 percent of voters in approval. Three months later, the financial crisis and the collapse of the stock market caused state tax revenues to plummet, and the Legislature responded by slashing school district budgets. Like other districts, Hermosa was forced to make deep programming cuts, including to art and music. The animating force behind the critiques from Measure S backers has been the impact of reopening North on traffic and congestion in the surrounding area. Scott Davey is a long-time resident who lives near North. He voted for the bond, and said he wants the project to happen. But he is worried that the narrow, curving streets surrounding North, and the awkward space on which it sits, are ill-prepared for the concentrated flow of cars that a reopened school is likely to produce. In meetings leading up the release of the Environmental Impact Report for North, Davey was the most popular guy in the room. Board members singled him out as a model of how to be constructive about the project, while even die-hard North project opponents found things to like, including his point about safety risks to kids walking to North on the surrounding streets, many of which lack sidewalks. But more recently, he has found himself frustrated by the district’s response to his suggestions in the final EIR, which the board approved at the same meeting. He feels he and others are being dismissed as no different than those who didn’t want North to happen in the first place. “All the people I’ve talked to in the neighborhood, they feel like they’ve been painted as NIMBYs — ‘Oh, you just don’t want a new school’ — and it’s absolutely not the case. We’re for the new school, you just haven’t listened to our legitimate concerns for the last one or two years. You’ve just kind of blown them off, and we’re extremely disappointed that your talk of working with the city, all these mitigation measures, hasn’t gone anywhere. We haven’t tried to stop the project, we’ve said, Make it better,” Davey said. Resident Claudia Berman, who also backed Measure S, submitted a letter urging the board not to approve the North project. Following the meeting, she said she was dismayed at the way the board’s conversation about nuts-and-bolts issues became a conversation about the school bond. “I have to say, I was disappointed in the school board discussion on the topic. They seemed to be a bit stuck on Measure S in general, rather than discussing the merits of the FEIR,” Berman said in an email. Board members were clearly emotional as they took the microphone to explain their votes. Some appeared to fight back tears. Along with the release associated with reaching a milestone years in the making, the comments took on the tone of venting long-suppressed sentiments. In an interview, School Board President Doug Gardner said the tone of the board’s comments before voting to approve the project reflected those of the speakers that night. While past meetings on the EIR had featured an increasing share of residents with practical concerns about traffic, the January meeting did see a return of speakers raising arguments that dominated the Measure S campaign, including claims that the district could use the Community Center for campus space, or that North School was eligible for protection as a state historic structure. “I had prepared some comments that were much more about the adequacy of the EIR, where we were in the project, what the project is. We do believe the EIR is adequate. Some people probably took that as a given, and I know there are people out there who disagree with it, but we are confident that it is adequate. Where the meeting had gone, what the public comments were, what my colleagues had said, convinced me that it was necessary to add that context as well,” Gardner said. If Gardner and other board members come across as agitated when discussing the EIR, it is in part because the process has taken far longer than they had planned. In January 2018, the city released a letter criticizing the methodology used in the report’s original traffic study, saying its peak-hour analysis failed to capture the concentrated impacts of pick-up and drop-off. After several months of consideration, the board voted to redo the analysis, focusing in on half-hour peaks. They did so reluctantly. This analysis, they point out, has been called for in no other project in Hermosa. It is also unusual for a school anywhere. For example, the Los Angeles Unified School District deployed an hourly level-of-service analysis in the environmental assessment for the largest school construction program in the nation’s history, which concluded in 2017 with 131 entirely new campuses and 65 modernized ones. Some residents, though, say that the unique characteristics of the North neighborhood merited a different approach. “It’s not on a major arterial, and there are streets without sidewalks. To me, a traffic engineer or an analyst should have said, ‘Wow this is kind of a unique case.’ It’s not a Mira Costa, or even a Valley or a View,” Davey said. The recirculation of the traffic sections of the EIR pushed the approval process back months, and added to the costs. It also set a template for future discord: Backers lament that meddling is adding to project costs, but opponents say things should have been done differently in the first place; backers say they are being held to a higher standard, while opponents feel demonized. Both in comments to the EIR and in critiques during and after the meeting, one of the most common requests has been for an alternative, smaller project at North that would allow the district to incorporate on-site pick-up and drop-off. Current plans call for 17 classrooms. (Fifteen of them will be for regular instruction and two will be specialized labs.) Using a state-mandated formula of 30 kids per classroom, the district planned for 510 kids. But because enrollment indicates that there are just under 300 third and fourth-graders in the district, some residents said the number of classrooms could be decreased, in order to lessen the impact on city streets. Lowenthal, Hermosa’s City Manager, said last week that the adversarial design of the environmental planning process obscured the extent to which the city and the district agreed on many things, including the welfare of students and residents. Later that day, Lowenthal sent Escalante the letter asking for a six-month extension of the statute of limitations for challenging the EIR.